Starting up your own business can be a daunting process, and one of your biggest concerns may be that you don’t get enough customers, and thus don’t make enough profit to survive. However, using search engine optimization (SEO) techniques is a great way to establish your brand and identity and create an online presence for your company. Often, when you are first starting out, you don’t have a lot of time or money to put into your SEO strategies, but these tips will help you develop and engage with your online audience. Many SEO strategies start with the use of keywords, as every time we log on to a search engine, we use keywords to find the information we need. So, it is important that you research what keywords your target audience is searching when they are looking for websites such as yours. Having a good knowledge of which words are commonly associated with your business gives you a powerful advantage, as it means you can ensure you appear higher up on search result listings. Top Tip: Keep your keywords simple and basic and avoid using too much industry jargon in them! It is now essential that your site is mobile accessible so that your content can be viewed no matter which sort of device they are using. Google, the most popular search engine provider out there, has recognized the importance of mobile-friendly content and will demote your site’s rating if you do not use mobile optimization. Smartphones are the most popular devices for internet browsing, so more searches are done on tablets and smartphones rather than desktops and laptops. Think of all the traffic you are turning away if your site isn’t mobile accessible. By using the free Google Analytics service, you can track how many people are viewing and engaging with your website and trace how your viewers are finding you online. This will help with your keyword research but will also help you develop more relevant content based on previous content that has proved to be popular with your audience. You should be sure to check out the websites of your major competitors so that you have an idea of what you are up against. If you know that a competitor has a search engine ranking, then this can help you work out which types of content are most popular. Creating content for your startup can be a difficult and daunting task, but don’t try to over complicate things. We know that you want to show off your skills and industry knowledge, but your audience may not be experts themselves and are likely to go to a different site if your content is difficult for them to understand. You should aim to create content that any viewer could understand, even if they have no background knowledge of your industry or business. A developed social media presence is one of the most important aspects of search engine optimization, as it is where a lot of people go to for information and recommendations. You should make sure you have developed and regularly updated social media accounts that offer relevant information about your startup. Be aware that you won’t be able to cover everything on your social media account, so keep it basic, but add links to your website that can provide further information. It is important that a user has a good idea what sort of content they will find when they click on your website, so it is important that you keep your content relevant. Internet users often browse the internet looking for something specific and will head to the website that they think will be most helpful to them. Therefore, you should be sure to keep content specific to your industry. There are many free SEO tools out there that you can use to help you develop your overall strategy. For example, free tool Siteliner scans your website and looks out for any broken links or redirect link errors that limit your site’s accessibility and may deter users. Similarly, online tool detailed.com gives you the chance to assess your competitors and generates a list of all the other popular websites that exist within your industry. It also shows you any social media brand mentions of competitors, so you can see what is being said about them online. Infographics have become increasingly popular in recent years, as they are a great way to get information across to your audience in a visually appealing way. Infographics are frequently shared on social media, so they are a great SEO tool when trying to generate attention for your startup, as well as getting information across about your brand. You are unlikely to engage with your audience by posting long reels of information, but an infographic is a better way to tell your audience what you want them to know. There are many different forms of content that you can implement when creating a website for your startup. You should create your content with your audience in mind and think about what they would expect to see from your website. For example, blog posts have become very popular in recent years and are now regularly used as a search engine optimization technique. These could take the form of ‘How-To’ articles that refer to frequently asked questions in your industry. This will make your website a source of knowledge for your audience, which is more likely to make them revisit your site if they ever need information or advice in the future. Starting up your own business can be a very daunting journey, but it can also be very rewarding if you do it properly. 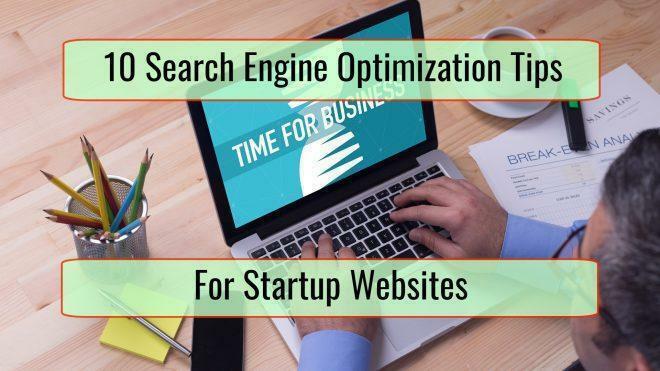 Your website can go from strength to strength if you follow these search engine optimization tips that will help you develop not only a great place to promote your products or services, but also a place that people in your industry come to for help.